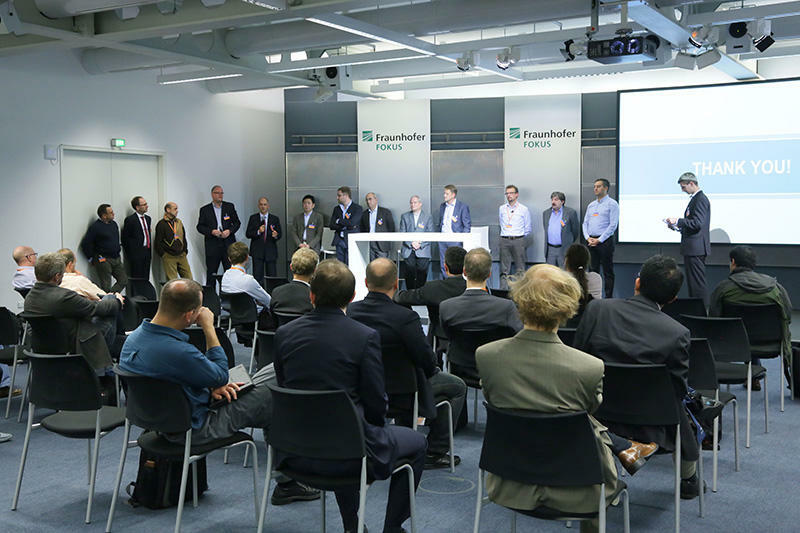 The fifth FOKUS FUSECO Forum was successfully held in Berlin, Germany on November 13-14, 2014. 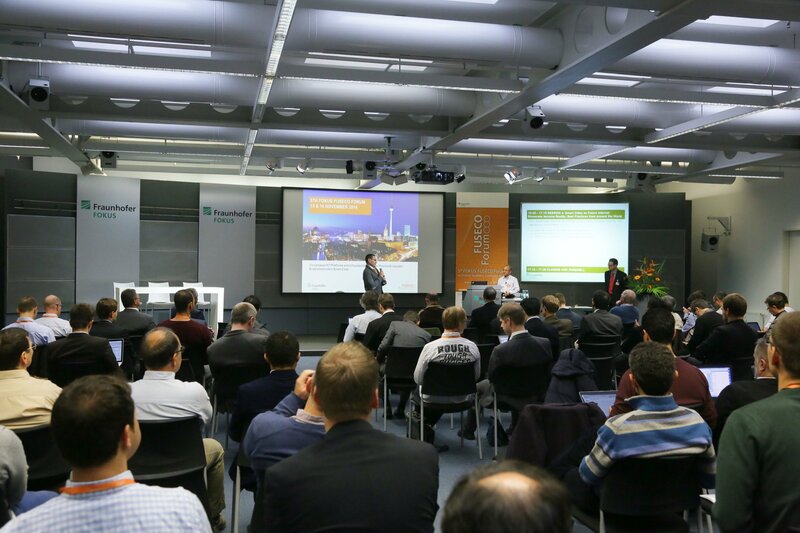 The forum, entitled “Cloud-based ICT Platforms and Virtualized Networks for flexible Ecosystem enablement within Smart Cities”, was chaired by Prof. Dr. Thomas Magedanz and proofed again to be a premier international Forum for experts in the field as it was attended by 230 participants from 31 different countries. Through four parallel tutorials, interactive workshops and demonstrations on the new technological advances it was confirmed that based on global Future Internet research activities, the ongoing virtualization and "cloudification" of service and network infrastructures is globally progressing rapidly and that new application domains beyond voice and video communications are emerging majorly based on Machine-to-Machine communications under the banner of Smart Cities and the Internet of Things. Tutorial 1 "Emerging Cloud-based smart communication platforms for SmartCities"
The first tutorial performed by Prof. Dr. Thomas Magedanz and Dr. Niklas Blum was attended by around 45 delegates and set the floor for this year`s FUSECO Forum. It introduced Smart Cities as a major Future Internet research use case which now becomes very relevant for the industry. The tutorial introduced all relevant technologies and showed the evolution path from Next Generation Network Service Delivery Platforms towards cloud-based, fully virtualized enabling platforms for diverse Smart City applications, such as eGovernment, eHealth, Smart Energy, etc. The tutorial was closed by an overview of the relevant FOKUS toolkits to prototype Smart City applications. Workshop 1 - "Communication Clouds enabling new Service Ecosystems"
The half-day interactive workshop was led by Dr. Niklas Blum from Fraunhofer FOKUS, Germany, and Serge Lachapelle from Google, Sweden.Session 1 titled "Taking the Pulse on Innovation and Disruption in the Telco Service Domain" was opened by Jürgen Galler who presented on opportunities for operators to innovate in the service layer to continue competing successfully with other service companies from the Internet and web domain. Gil Rosen described an approach by Deutsche Telekom building on-top of Jürgen’s presentation. Bjorn Remseth from Telenor Digital described current efforts of launching an MVNO by applying light-weight technologies ranging from OpenStack-based virtualization environments to open source service technologies. Carsten Bock from ng-voice presented on experiences and lessons-learned by deploying VoLTE in Bulgaria and South Africa based on an open source IMS and Asterisk. The current status of WebRTC and its upcoming roadmap was presented by Serge Lachapelle from Google and Paulo Chainho from PT Inovacao, Portugal, presented research activities to provide interoperability between different kind of signaling approaches based on WebRTC. The session was ended by a presentation from Stefan Weil from GSMA providing a status update on operator network APIs and a global, federated API solution.Session 2 titled “Deep Dive into Architecture, Media and Platforms for new Communication Services” was started with a presentation by Dave Nugent from PubNub describing how service-layer event-driven communication for cloud services can be used to provide a communication layer for IoT and human-to-human communication services. After this presentation Jeremie Lecomte from Fraunhofer IIS presented latest standardization activities for high-definition audio codecs for VoLTE. Henrik Lundin from Google’s WebRTC team gave an introduction into audio packet handling in Chrome to handle network congestion, packet loss and delay. Michail Rikakis from Sinch in Sweden presented an approach for in-app real-time communication enablement on mobile devices acting on top of operator networks. The second part of this session was opened by Robert Nyman from Mozilla giving a status update on Firefox OS. Martin Geddes gave an outlook on how communication should be handled in the future and who will own the content of the exchanged information and related privacy topics that should be addressed by researchers and product managers when designing future services. The session was closed with a presentation by Luis Lopez from the Kurento project describing and demoing a scalable cloud solution for advanced video communication services. Tutorial 2 - "5G Foundations and Core Network Evolution: Radio, Convergence Core, Cognitive Management and Virtualisation (SDN/NFV)"
Tutorial 2 held by Dr. –Ing. Marius Corici (Fraunhofer FOKUS) and Giuseppe Carella (Fraunhofer FOKUS) provided a comprehensive overview of the network architecture evolution from current telecommunication networks towards 5G, including support of the new 5G radio access, LTE and WiFi, convergent core network support (integration of fixed, backhaul and satellite). In addition, virtualization trends on telco networks including Network Functions Virtualisation (NFV) and Software Defined Networks (SDN) concepts and the support for highly heterogeneous devices and applications were addressed in this tutorial. The main focus was on the evolution of the core network platform beyond the current 3GPP Evolved Packet Core (EPC) as a network and service control including security, mobility support, QoS and connectivity management, monitoring and network management. Afterwards, this tutorial outlined how the major concepts will affect the core network architecture and each other beyond EPC in the future. Additionally, the scope of the SDOs (3GPP, ETSI NFV, IETF, ONF, etc. ), their initial results and their future directions were introduced. The tutorial finalized with outlining how the new technology can be brought in a relevant manner to the 5G R&D and later exploited in the 5G ecosystem. 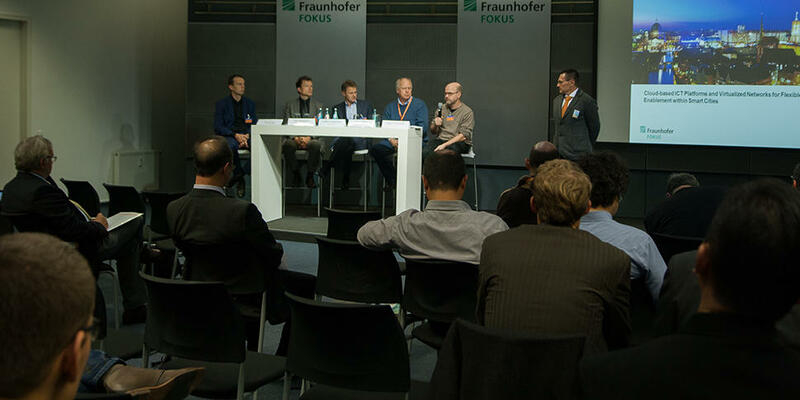 Furthermore, the software toolkits and experimentation platforms of Fraunhofer FOKUS and TU Berlin have been introduced, namely Open5GCore as evolution from the OpenEPC, OpenSDNCore and the 5G Berlin Testbed enabling demonstrations and hands-on know how accumulation and comprehensive prototyping in the context of academic and industry research. Workshop 2 - "Towards 5G: SDN/NFV, Convergence and Applications Enablement"
The second workshop was chaired by Julius Mueller (TU Berlin/Fraunhofer FOKUS) and Dr. -Ing. Marius Corici (Fraunhofer FOKUS) consisted of two interactive sessions with 12 international speakers and one panel that brought together standardization organizations, EU commission and network operators. 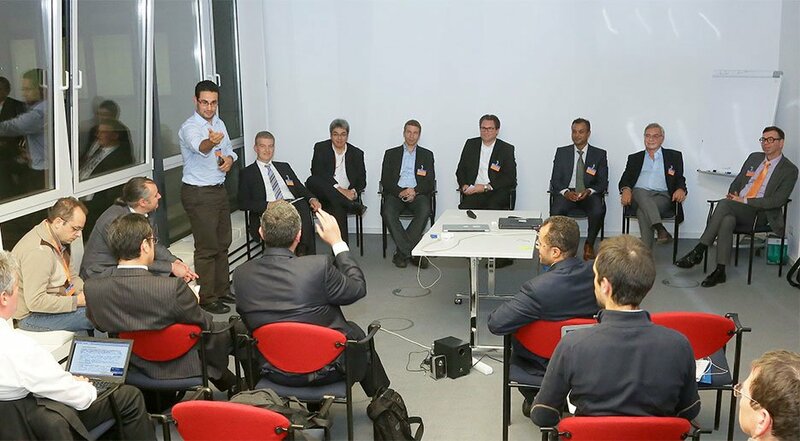 Together they considered the evolution of the networks towards 5G. Hot topics on new networks technologies beyond the current LTE and EPC deployments and specifically virtualization technologies such as Software Defined Networks (SDN) and the Networks Functions Virtualization (NFV) were discussed with expectations, limitations and ongoing Proof of Concept (PoC) demonstrators. Additionally, it provided a vivid debate on carrier-grade networks, discussing which stakeholder (network operator, vendor, or service provider) should guarantee network and service reliability. The role of open source and standardized SDN north/southbound and east/westbound interfaces as well as changes in the value chain caused through virtualization were also reviewed. The speakers of the workshop are affiliated with European Commission DGCONNECT, Deutsche Telekom, Orange Labs, ONF, Fraunhofer HHI, Telefonica, NICT, Vodafone, Türk Telekomünikasyon, Portugal Telekom and Telecom Italia. Tutorial 3 - "Uniform IoT/M2M Service Development in Smart Cities"
The third tutorial was performed by Dr. Adel Al-Hezmi and Konrad Campowsky was attended by around 25 delegates. The tutorial introduced various use cases as motivation for the M2M/IoT research in particular the Smart Cities as a major Future Internet research use case, which now becomes very relevant for the industry. The tutorial gave an overview about the current market and related business and technical challenges. It presented the relevant standards on different levels ranging from access technologies, protocols and up to the M2M/IoT system architecture. Afterwards the tutorial discussed about various available M2M/IoT solutions and platforms available in the market and presented the comparison between these solutions from different perspectives. Finally, the tutorial presented OpenMTC as a reference solution for M2M/IoT and highlighted the main features of the release 4, which was announced during the event. 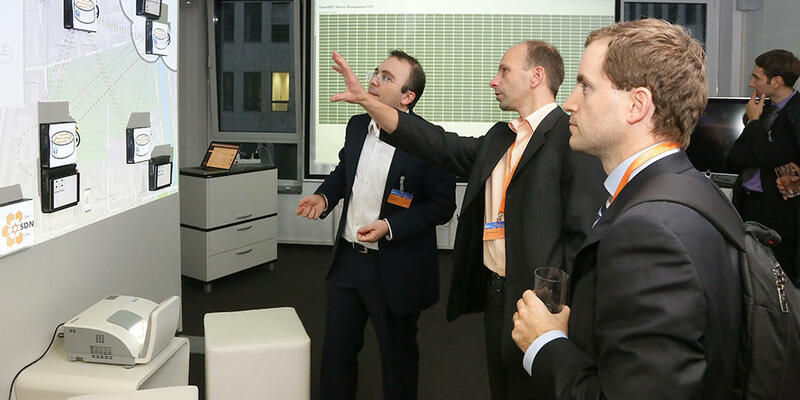 Various demos from different vertical domains were demonstrated. An interactive workshop on “IoT/M2M Platform Convergence and Services for Smart Cities" was led by Dr. Adel Al-Hezmi from Fraunhofer FOKUS, Germany. Session 1: “The Evolution from M2M towards IoT from Platforms and Architectures" was chaired by Enno Borchers from Deutsche Telekom AG, Germany. Mr. Enno Borchers opened the session with various M2M aspects from Deutsche Telekom perspectives. Ernst-Joachim Steffens from T-Labs Deutsche Telekom presented on farming 4.0 and related M2M architectures. Mr. Daniel Godde from Ericsson GmbH, Germany, presented the evolution of M2M for enabling smart cities. Finally, Emil Berthelsen from Machina Research, UK presented how platforms need to and are evolving to meet the changing requirements of M2M and IoT. He introduced the notion of Subnet of Things (SoTs) as the pathway of data environment. Session 2: “Innovative M2M/IoT applications and services" was chaired by Prof. Manfred Hauswirth, Fraunhofer FOKUS director. Various verticals and services were presented during this session: Dr. Bernd Heinrichs, EMEAR Industrial IOT Solutions from CISCO, Germany, presented the role of Fog as edge computing node in an M2M/IoT environment with various capabilities and features. Gabriel Wetzel from Bosch Software Innovations GmbH, Germany, presented various solutions and smart city services that are based on M2M technologies. Dr. Stefan Covaci gave an overview about the FI-Star project as M2M/IoT-based solution in the health domain. Finally, Sascha Wolter from Deutsche Telekom AG, Germany, showed various ways to use M2M technologies for developing creative and innovative services. 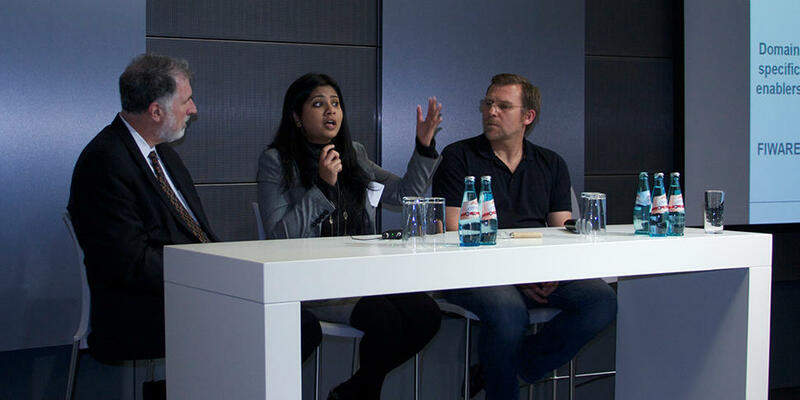 The M2M workshop finalized the day with a panel, which included different panelists from various disciplines and domains. The panel addressed the current business and technical challenges for M2M and paved the way for the realization of the smart city vision. In conjunction with the FOKUS FUSECO Forum 2014, XiFi, the capacity building part of the FI-PPP program, organized an international FI-PPP Workshop, a full day interactive session for the regional and international promotion of the European Future Internet ­ Public Private Partnership (FI-PPP) program on November 13, 2014. With participation of more than 50 guests and speakers the international FI-PPP workshop successfully provided a comprehensive overview of world wide Future Internet programs and the status of the FI-PPP program in particular. By fostering the collaboration with related regional and international initiatives and by openly discussing strategies for sustainability and commercial exploitation, several fruitful and lively discussions took place during the workshop. The workshop, themed “Bridging the gap between Future Internet Research and Innovation" started with a Session providing an overview of Future Internet Research and Innovation in Europe, the US, Canada and Asia, where Future Internet coryphées from the US (GENI, IGNITE, ON Lab), Canada (SAVI), Europe (FIRE, FI-PPP), Korea (ETRI) and Japan (NICT) presented how Future Internet programs and research infrastructures enable innovation around the globe. Subsequently an overview of the current status of the FI-PPP Platform(FIWARE / FI-CORE), FI-PPP´s Usage Areas (eHealth - FISTAR, Media and Gaming - FI-CONTENT), as well as the status and achievements of FI-PPP´s Infrastructure and Capacity Building project (XIFI) was presented. Afterwards relevant FIRE projects presented how Future Internet research infrastructures are being provided to and used by SMEs to test, harden and evolve their products. In this context , Fed4FIRE presented howFIRE´s federation of Future Internet testbeds is being used by researchers and SMEs, OpenLab presented how the OneLab facility is being opened for SME usage and CI-FIRE presented how startups and SMEs can benefit from EIT ICT Labs and FIRE. The session concluded with a presentation from the EIT ICT Labs activity "FanTaaStic" describing their approach for commercially offering Future Internet testbeds for Europe´s ICT Education, Research, and Innovation. In the final session on FI-PPP´s Business Development Acceleration, two accelerators of the third phase of the FI-PPP program (“Speed UP! Europe" and “Finish") described how SMEs are currently (and will be) supported in developing FIWARE-based applications as well as in their entry to the market. The FI-PPP workshop concluded with a panel discussion where several invited panelists involved in the FI-PPP answered questions around FI-PPP´s exploitation, commercialization and sustainability. 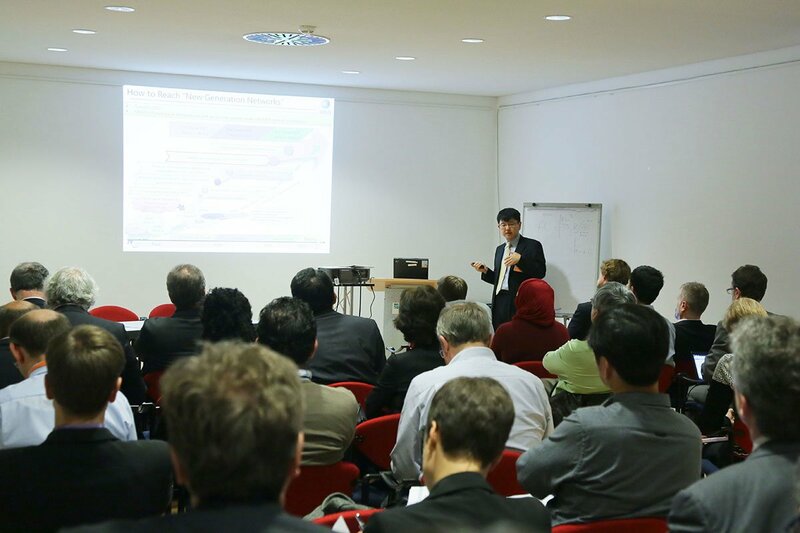 Core topics included questions related to the sustainability of the FI-PPP infrastructure (i.e. the federation of FIWARE nodes), the added value of standardizing FIWARE platform's Generic Enablers and their APIs. Future plans for creation of a FIWARE foundation and ecosystem and strategies for SMEs to exploit the results of the program were also discussed. The FFF14 Conference Day was opened by a short welcome note given by Prof. Dr. Manfred Hauswirth, the new director of Fraunhofer FOKUS and a globally known expert in the Internet of Things and Data Analytics research communities. Subsequently, Prof. Dr. Thomas Magedanz opened as chairman the conference themed "Smart Communication Platforms for Emerging Smart Cities", which puts the different streams of the previous day into a single context. 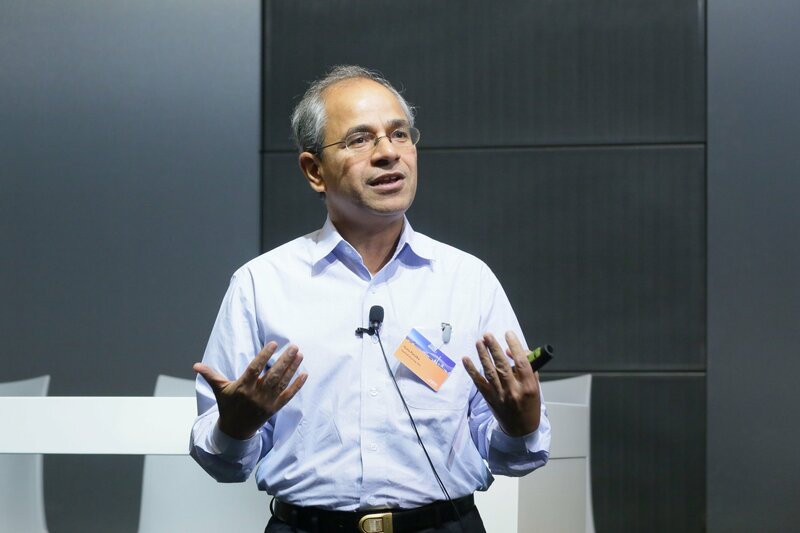 Guru Puralkar from ONF/ Standford University gave a keynote on the SDN / NFV and Cloud principles and the role of open source software for driving innovation in the internet and telecom world. He introduced the new Open Networking Operating System (ONOS), which will be released in December 2014, and which should make SDN programming much easier and faster. The first session on "Broadband Access Convergence in Smart Cities: Evolution Path to 5G based on SDN and NFV" was chaired by Hans Einsiedler from Deutsche Telekom Laboratories. Pedro Aranda Gutiérrez from Telefonica I+D, Spain talked about "The S-factor in SDN: How to exploit the Software aspect of SDN and NFV" and looked at service creation aspects of SDN infrastructures addressed in a European R&D project. Subsequently, Volker Sebastian from Vodafone, Germany reported in his talk "Cloud meets Networks" about the current NFV/SDN activities inside Vodafone, where IMS is already deployed in the fixed network part in an NFV like approach and an EPC virtualization is planned for the near future. In the session panel, which was also joined by Guru Puralkar, interesting discussions on the role of open source software, open network APIs and network neutrality impacts were discussed. The second Session "H2H in Smart Cities: Virtualised EPC/IMS/RCS/VoLTE vs. WebRTC and OTT Communications" was chaired by Prof. Kurt Tutschku from the Blekinge Institute of Technology, Sweden. First Franz Seiser from Deutsche Telekom AG, Germany talked about "NFV experiences from Deutsche Telekom" and stressed, that there is a big difference between "virtualization" and "cloudification" and in order to take full advantage of NFV the software platforms have to be "cloudified". 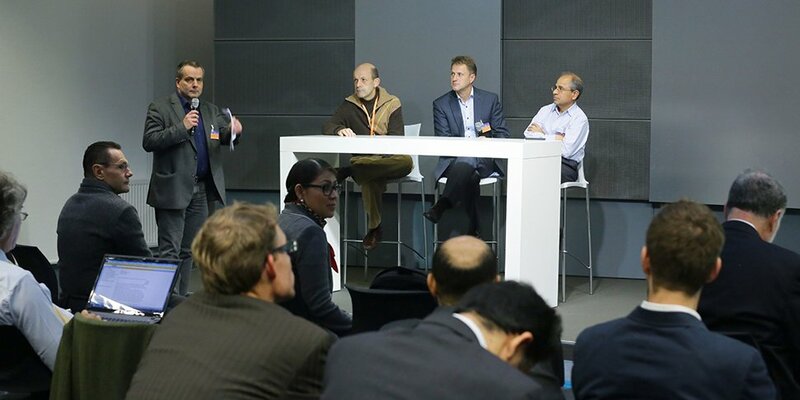 In his talk "Virtual and Real Challenges when Launching VoLTE and RCS" Karsten Schröder from Telefónica Germany shared the experiences of launching VoLTE and RCS services with the Telefónica IMS. Finally Thorsten Waschkeit from Kabel Deutschland, Germany talked about his "Experiences with IMS deployment and future perspectives" and showed also the future plans towards a virtualized IMS solution. After the lunch break Prof. Magedanz chaired a Panel on "Cloud-based Telco Platforms enabling competitive Smart City Applications", which was staffed by network operators and research program directors, namely Franz Seiser (Deutsche Telekom, Germany), Joel Bacquet (European Commission, Belgium), Volker Sebastian (Vodafone GmbH, Germany), Bjørn Remseth (Telenor Digital, Norway), and Chip Eliott (Raytheon BBN, USA). 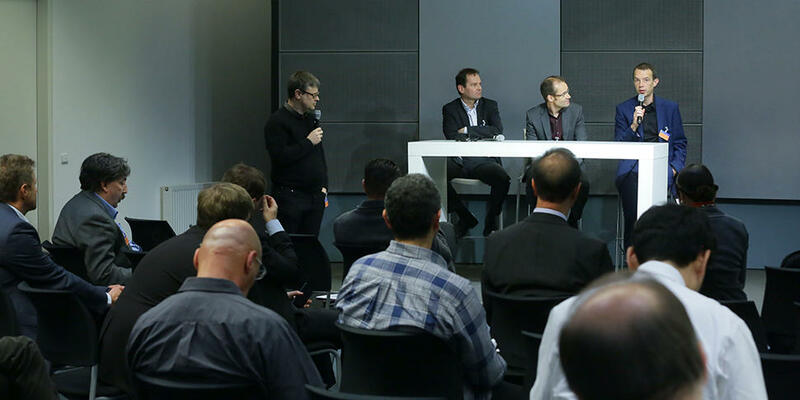 Major discussion points were the different options for operators to act as SDN infrastructure providers or as MNO on top of such infrastructures. The role of regulation and network neutrality was also discussed. Prof. Phuoc Tran-Gia from University Würzburg, Germany chaired the third Session on "M2M in Smart Cities: Internet of Things as Key Driver of innovative Smart City Services". Percy Ott, from Cisco in Germany, talked about "Cloud-based ICT Platforms and Virtualized Networks for flexible Ecosystem enablement within Smart Cities" and stressed the value of Smart City solutions for the economy. In his talk "From M2M / IoT towards Smart Cities in Indonesia" Sigit Hadi Prayoga, PT Telekomunikasi, Indonesia described current IoT use cases considered within the Indonesian Digital Network Initiative and their currently used M2M platforms. Peter Friess from the European Commission talked about "IoT Ecosystem perspective – the next step in IoT innovation and take-up" and presented upcoming funding opportunities for large scale pilot projects in Europe. The session panel discussions centered around the question, if there is too much government involvement in Smart City implementations, but obviously this is needed to assure a long term benefit for the society. The final Session "Smart Cities as Future Internet Showcase become Reality: Best Practices from around the World" was chaired by Chip Eliott (Raytheon BBN, USA). Ms. Archana Amarnath from Frost & Sullivan, UK talked first about "Global Smart City Market – A $1.5 Trillion Market Opportunity by 2020" and set by this talk the motivation for various Smart City projects around the world. Then Glenn Ricart, CTO of the US IGNITE initiative presented a snapshop of recent US activities in his talk "Smart City Prototyping in the US: Experiences from the IGNITE Program". Finally, Prof. Thomas Michael Bohnert from ZHAW, Switzerland reported in his talk "FIWARE2FICore: Smart City Prototyping based on Future Internet enablers" about the most recent activities in the European Future Internet community, where new toolkits (Fi-Ops) and infrastructures (FI-Labs) are provided in several acceleration activities for SMEs. The session panel revealed, that network operators are in a very good strategic position to realise Smart City infrastructures and services. Prof Magedanz closed the successful event by giving thanks to all the chairmen, speakers, panelists and the local organisation team. He pointed out, that it became clear during these two days, that based on global Future Internet research activities in the past and today, the ongoing virtualization and "cloudification" of service and network infrastructures is globally progressing rapidly and that new application domains beyond voice and video communications are majorly based on Machine-to-Machine communications emerging under the banner of Smart Cities and the Internet of Things. 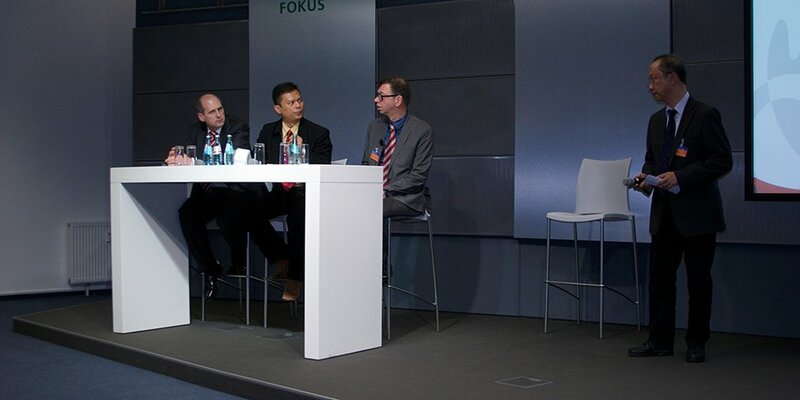 In order to follow timely the progress in this hot field of applied research, Prof. Magedanz invited the FUSECO family to the next FOKUS FUSECO Forum in Berlin.